Lars Troide on the differing paths to God of musical geniuses Gustav Mahler and Anton Bruckner. Throughout history, the human race has sought through its music to bridge the gap between Heaven and Earth. In the Judeo-Christian tradition, there are the psalms of David ("O Come, Let Us Sing to the Lord"), Gregorian chants (Saint Augustine wrote, "He who sings prays twice. "), Renaissance polyphonic motets, Masses, hymns, and the like. In 19th century Europe, the large-scale Romantic symphony became, for some composers, a vehicle for elevating the listener to virtually unprecedented heights of spiritual transcendence. Two such composers were Austrians Anton Bruckner (1824-1896) and his younger compatriot Gustav Mahler (1860-1911). No. 1 (called the Titan), made in 1961 by the octogenarian conductor Bruno Walter, leading the Columbia Symphony Orchestra. As a young man, Walter had been Mahler's protegé, thus he was a direct link to the composer's style of conducting his own works. The Titan's first movement opens with a long, sustained high note in the strings, meant to represent the gradual awakening of life in the spring. The effect is unearthly. Eventually the listener hears, softly in the distance, the sound of hunter's horns that slowly approach, finally erupting in a series of raucous whoops. This was a world of sound such as I had never experienced. A few years later, I encountered Bruckner's music, specifically his Symphony No. 4 (called the Romantic). This most immediately accessible of Bruckner's symphonies begins quietly, with a lofty theme played by the horns over shimmering strings. The remainder of the movement consists of a typically Brucknerian succession of tender lyrical passages alternating with outbursts of epic grandeur. I had discovered yet another original and compelling symphonic voice, similar to Mahler's but different in important ways. Bruckner and Mahler are similar in the size of their orchestras (typically a hundred instruments or more) and the grandiosity of their aspirations: their completed symphonies (18 in all; 9 each) are typically an hour or more in length and explore a wide range of musical emotions and effects. But Bruckner, the older, stands squarely in the 19th century Romantic symphonic tradition foreshadowed by Mozart (his Jupiter Symphony No. 41) and pioneered by Beethoven, beginning with his Third Symphony (the Eroica). Bruckner's Third Symphony, likewise, is his breakthrough work, starting (like the Fourth) with a solemn theme in the strings over cascading strings, but in the minor, not major, mode. The atmosphere (as in Mahler's Titan opening) is haunting, mysterious, suggesting a supernal world beyond our limited human senses. But his remaining six symphonies, beautiful and grand, are in a positive sense more of the same: lush, lyrical, epic, employing the instrumental and tonal palette of other 19th century composers such as Wagner, whose operas Bruckner particularly admired. Bruckner's symphonic world is serene, radiant, but also highly dramatic. The reason for this is simple. Bruckner, a man of humble origins, was from birth a Roman Catholic whose music, which also includes religious motets and Masses, reverberates with the Christian story of peace, struggle, sacrifice and redemption. His was a childlike faith. The urbane Mahler, when he met Bruckner, described him as "half simpleton, half God." This description reminds one of the impression Saint Francis of Assisi made on his contemporaries. Though Bruckner had his moments of spiritual struggle and doubt, as virtually all believers do, he never lost his faith in God. He dedicated his Ninth Symphony to "my beloved God"; during its composition, Bruckner, old and suffering from a weakened heart, would drop to his knees and beg the Lord to grant him the time and strength needed to complete it. He did, all but the last movement, and it is performed today in the three movements he achieved. The case of Mahler is very different. He was brilliant, but moody and neurotic (he was psycho-analyzed by Freud). His music reflects a seeking after God that was never fully satisfied. His many biographers have portrayed him as an agnostic Jew. His neuroses stemmed from a tumultuous childhood home life (Freud's analysis) and from the anti-Semitism of contemporary Austrian society. By his own testimony, he always felt marginalized—an outsider—and this sense of alienation extended to his relationship with God. It is clear to me from his symphonies that he sought the divine, but the search was sporadic and often punctuated by episodes of despair, "dark nights of the soul" characterized by crashing dissonances and terrifying funeral marches. The first funeral march is found in his First Symphony. The slow movement was possibly inspired by a macabre illustration by Moritz von Schwind of a hunter's funeral procession, attended by the wild creatures that had been his prey. The first melody is the familiar "Frère Jacques," but transposed into the minor mode and performed in a suitably funereal tempo. This movement illustrates Mahler's brilliantly sardonic wit, his ability to adapt the most unexpected materials to his musical purposes. It is at once melancholic, amusing, lyrical, and moving in a way that defies analysis. If Mahler's metaphysical yearnings are implicit in his First Symphony, they become explicit in his Second, the Resurrection. Broadly modelled on Beethoven's Ninth (Choral), it begins with a tempestuous movement in a minor key, reflecting the fear, doubt and turmoil of earthly life. But even in this initial movement, there are interludes of celestial beauty, played by the strings. The second movement, by contrast, is a lovely waltz or Ländler in 3/4 time. In subsequent movements there is an alternation of resignation, serenity, fear and trembling, culminating in a shattering evocation of the Judgment Day, followed by a mighty hymn of affirmation of eternal life sung by a huge chorus of male and female voices, again suggested by Beethoven's Ninth, which ends with a setting of Schiller's "Ode to Joy." Mahler's Symphony No. 2 raises the issue of his Catholicism. It was written between 1888 and 1894, and first performed in 1895. In 1897, Mahler converted to the Roman Catholic faith. Some critics condemn this conversion as a betrayal of his Jewish heritage. Others see it as merely a cynical or opportunistic move prompted by the fact that he had to be Catholic in order to assume the directorship of the Vienna State Opera. After his conversion, he reportedly never attended a single Mass. I believe that the explanation for Mahler's behaviour lies in the fact that, for him (as for many other composers, including Mozart, Beethoven, Schubert and Schumann), music itself was his true religion, his path to God. Besides being a great composer, Mahler was a dynamic and gifted conductor, though he once observed: "I conduct to live; I live to compose." Musically, Mahler was incredibly dedicated, hard-working and ambitious, and if conversion to the Catholic faith was necessary for him to conduct the Opera, then so be it. This was, in fact, no betrayal of any organized faith, be it Jewish or Catholic since he never really practised either, but rather an affirmation of his total commitment to what was for him the highest and most spiritual of arts. If Mahler's Second is his early hymn to God, his Third is a grand hymn to Nature. Symphony No. 4, smaller in scale than the first three, is the composer's most charmingly accessible. It has, for the most part, a luminous childlike quality from the first movement, titled "The World as Eternal Present," to its conclusion, a lovely, gently rocking pastoral setting of "A Child's Vision of Heaven" from the folk collection The Youth's Magic Horn, the words sung by a solo soprano voice. The movement and entire symphony ends magically with the same note strummed five times on the harp, unaccompanied, suggesting a child falling asleep. An earlier "magic moment" occurs at the conclusion of the penultimate movement, where the strings ascend in a succession of beautiful harmonies, like a stairway to the concluding "Child's Heaven." The Fifth Symphony opens on an altogether grimmer note, with a trumpet fanfare leading into a ponderous and fearsome funeral march, followed by a tumultuous swirl of orchestral notes bordering on chaos. The Adagietto movement is a love song to Mahler's wife, the beautiful and talented Alma Schindler, who after Mahler's death would marry, first, the architect Walter Gropius and, second, the novelist Franz Werfel, who wrote The Song of Bernadette. The Adagietto of Mahler's Fifth became famous as the background music to Visconti's 1967 film, Death in Venice. As usual, Mahler's musical moods swing between darkness and light, hope and despair, sometimes with startling abruptness. In the Sixth Symphony (the Tragic), we are once again in dark, sinister waters. It starts with a military quick march in the minor mode, punctuated by a rhythm of left, right, left right, left. The listener feels as if he is being compelled toward some unidentified catastrophe. The overall sense of impending disaster is interrupted periodically by a delicately amorous theme played on the celesta, directed at Alma. Mahler wrote on the score, "To live for thee; to die for thee, Almschi!" But despite moments of soaring romanticism, the symphony ends in total gloom, punctuated in the last movement by three sledgehammer blows of the tympani, which Mahler stipulated should sound like "the fall of an axe." Perhaps the most rewarding parts of Mahler's Seventh Symphony are the two movements titled "Night Music," which evoke the natural world being enfolded in darkness. 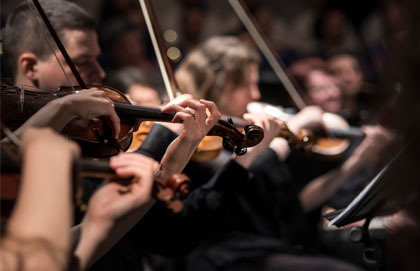 The Eighth Symphony (Symphony of a Thousand) is, as the name implies, the largest of the composer's works in scale: in addition to the orchestra, it is scored for two adult choirs, a children's choir and eight soloists. In two parts, it begins with a majestic setting of the medieval hymn "Veni Creator Spiritus" ("Come, Creator Spirit"). The second part is a setting of the final scene of Goethe's Faust, where Faust, rescued from the clutches of Mephistopheles, ascends into Heaven. The unifying theme of the whole work, which lasts some 85 minutes, is redemption through love. The Eighth, like the Second, is a soaring affirmation of man's spiritual yearnings. Its premiere performance on September 12, 1910, in Munich was a triumph. But eight months later, the composer was dead at the age of 50 from bacterial endocarditis. His final works, "Das Lied von der Erde" ("The Song of the Earth"), the Ninth Symphony and the uncompleted Tenth, received their first performances only after his death. Understandably these works, composed while he was increasingly ill, contain strong elements of anguish and suffering. They are also the most musically advanced of his symphonies, heralding the harmonies and dissonances of 20th century composers. Two of these, Schönberg and Berg, later practitioners of atonal music, were present at Mahler's funeral, which was a relatively simple affair, consisting of a blessing in the church followed by a graveside service, with no speeches or music, as stipulated by Mahler. Bruckner's funeral, by contrast, consisted of a full-scale requiem Mass in the church of the St. Florian monastery near Linz, where he had resided as a layperson for many years. The symphonies of Bruckner and Mahler have long been staples of the concert repertoire, performed by orchestras from Berlin to Tokyo. Mahler's are the more difficult and complex, and thus took longer to be established in the repertoire. His later symphonies are distinctively "modern," and thus form a bridge from the Romantic to the contemporary world. Broadly speaking, I believe it fair to say that Bruckner's works reflect the older certitudes of the Christian faith, whereas Mahler's—even the early compositions—reveal the anxieties of a world order that is breaking down, as seen in the pronouncements of his contemporary Nietzsche ("God is dead"), foreshadowing two horrendous world wars and genocides on an unprecedented scale (perpetrated by Stalin, Hitler, Mao Zedong, Pol Pot and other mass murderers). The angst of his symphonies appeals to a world that has been morally and spiritually cast adrift. Bruckner's world is far more serene, and therefore has perhaps a more nostalgic appeal to modern listeners. For Bruckner, God was never dead nor did He sleep. He was (is) the active principle of all things, the creator and sustainer of everything. Bruckner's beautiful melodies evince God's tender love, while his dramatic episodes evoke the grandeur of His creation, suggesting vast prairie vistas, epic mountain ranges, gorgeous sunsets, and the like. Mahler, the marginalized agnostic, always sought the divine in his symphonies, momentarily finding it in passages of supernal loveliness, but also falling back into the depths of temporary nihilism and despair. He makes me think of these lines of his favourite, Goethe: "Wer immer strebend sich bemüht, Den können wir erlösen" ("He who ever strives, Him can we redeem"). Perhaps the childlike faith of Bruckner and the endless striving of Mahler are both roads to salvation. Lars Troide is a retired professor of English literature who has had a lifelong love affair with classical music.